Special Correspondent from New York, Sep 18 (Just News): The world is facing the threat of Nuclear weapons of North Korea, refugee influx and ongoing atrocities by Myanmar authorities on Rohingyas. World leaders now gather at the United Nations in New York as its General Assembly begins. The spotlight will be on US president Donald Trump and France's new leader, Emmanuel Macron, who will both be making their first appearance at the General Assembly. They will be joined by more than 100 heads of state and government, including Zimbabwe's president Robert Mugabe, one of Africa's longest-serving leaders who is said to be bringing a 70-member entourage. While Trump's speeches and meetings will be closely followed, it will be North Korea, which Secretary-General Antonio Guterres calls "the most dangerous crisis that we face today," that will be most carefully watched. No official event addressing Pyongyang's relentless campaign to develop nuclear weapons capable of hitting the United States is on the UN agenda, but it is expected to be the foremost issue for most leaders. 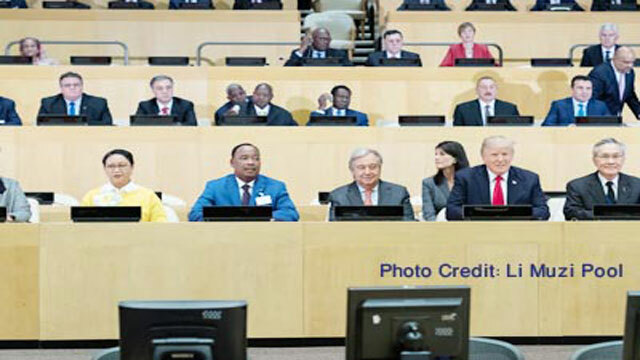 The US President Donald Trump totes his “America First” stance this week to the United Nations General Assembly, the annual inundation of diplomats and world leaders who this year await the new US leader with uneasy anticipation. The summit in Trump's hometown -- New York City -- has become the quickest-paced diplomatic event on the calendar for an American president. Trump arrived to the soaring, green-hued assembly hall facing open questions about his approach to hot-button issues like climate change and the Iran nuclear accord. His schedule over four days is stacked with one-on-one talks with foreign counterparts eager to discuss those global flash-points, as well as the deepening standoff with North Korea. The centerpiece, however, comes Tuesday during Trump's first UN address, a landmark foreign policy moment at the eight-month mark of his presidency. “This will be a great week, we look forward to it, as far as North Korea is concerned, I think that most of you know how I feel,” Trump said as he strode into the UN headquarters building on Monday. Once deeply critical of the UN -- right down to its iconic emerald marble -- Trump as President has achieved his principal diplomatic wins at the body's Security Council, which has passed waves of sanctions on North Korea. His first formal comments inside the headquarters building, however, focused not on diplomacy but on real estate. “I actually saw great potential right across the street,” he said at the beginning of a session on UN reform, referring to the Trump World Tower apartment building on United Nations Plaza. He said it “turned out to be such a successful project” due to its proximity to the modernist headquarters building nearby. He offered a more skeptical view of the UN's efficacy or its value to the United States. The UN “has not reached its full potential because of bureaucracy and mismanagement,” Trump said at the start of a session focused on reforming the institution. “We seek a United Nations that works to regain the trust of people around the world,” Trump said, insisting that member states "cut through bureaucracy" to better drive positive change. “I encourage all member states to look at ways to take bold stands at the United Nations with an eye toward changing business as usual,” Trump said.